In this game, players are explorer/builders in the Nebula Valley – trying to be the most successful player by fulfilling contracts and opening up areas of exploitation. The valley is depicted on the game board – with a few islands poking up through the fog of the valley. There are a bunch of meadow spaces. The exploitation tiles are shuffled and then placed one on each meadow space on the game board. Each player also gets a guild board to organize their bits (placing 2 craftsmen, 3 building sites and 5 buildings); they also place 4 stacks of meadow tiles on their player board. Each player is dealt two contracts which they keep secret and then four contracts are dealt to the board as public supply. Players then take turns – in each one, you get two points worth of actions. The actions are summarized in the center of your player board. There six different options; five of which cost one action point, and the sixth one costs two points. You may do the same action twice in a turn. 1) Place a Craftsman (1 point) – place a craftsman onto any exploitation token on the board. Take that token and put it on your player board (for scoring). Place the depicted resources on that token on the space on the board where the token came from. 2) Place a Building Site (1 point) – Take one of your building sites (a half-hex in shape) and cover a free half of a ruins hex on the board. You may never have more building sites present on the main board than you have buildings on your player board. 3) Explore a Fog Space (1 point) – Take a meadow tile from the leftmost stack on your player board and place it on a fog space; it must be adjacent to a space occupied by a piece of your color or adjacent to an empty meadow space. 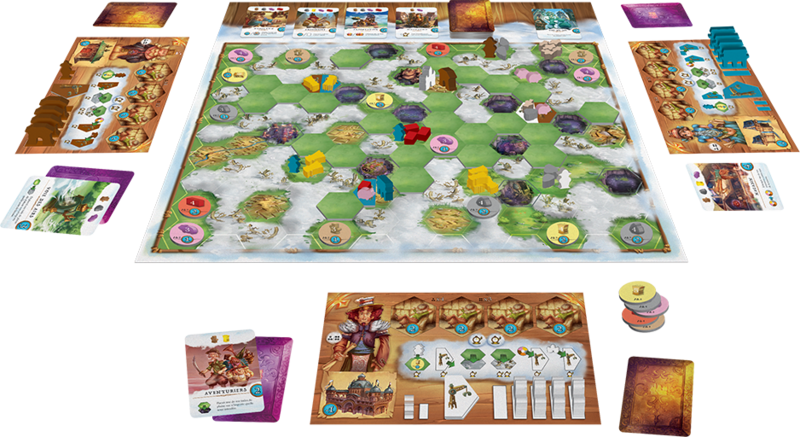 As you use a complete stack of meadow tiles on your board, you will reveal an explorer printed on the board itself – each explorer revealed will score you two points at the end of the game. 4) Explore a Petrified Forest (2 points) – Note that this is the only action that takes up both of your action points! Take a meadow tile from the leftmost stack on your player board and place it on a petrified forest space, using the same rules as for placing on a fog space. 5) Transport a Resource to a Building Site (1 point) – choose a resource from any open exploitation and transport it over an uninterrupted path of empty meadow spaces to one of YOUR building sites. If this is the last resource from an exploitation, the craftsman from that space is returned to its owner and that space now becomes an empty meadow space. 6) Construct a Building (1 point) – If one of your building sites has the required resources for a contract (either one of the ones in your hand or one of the four on the board in the public supply) – you can complete the contract. You now place a wooden building in your color in the place of the building site chit. The resources used to pay for the contract are discarded to the supply. Any excess resources on the site are placed on your player board, they will give you a one point penalty each at the end of the game. If you had completed one of the public contracts, deal out another contract to the board so that there are four available. The player now has the option to use the special action printed on the bottom of the contract card. Finally, the completed contract card is placed face down next to your board to be counted in the scoring. Game End – the game ends when a player has built his fifth (and final) building to the board. That player receives the “End of Game” card, and his turn immediately ends – even if he has only used one action point thus far. All other players now get one more turn. After that, ALL players collect any resources left on their building sites or on their exploitations and place them on their player board. The player with the most points wins! If there is a tie, the player with the fewest resources on their board at the end of the game wins. What makes the game click for me is that most of your gratification is delayed. You only have two actions a turn, and this makes it nearly impossible to sneak up on the table and complete a card all at once. Everything is done in small increments. To make things spicier, almost all of your actions stand to benefit everyone else as much as yourself! If you open up a new exploitation – sure you get the benefit of the points on the token – but it is entirely possible that the table takes all of those goods away before you can take more than one of them. Each time that you build a meadow tile to supply one of your building sites, you’re also helping others get to their sites. In our games, we’ve never had overt alliances – though I suppose that this could be a viable strategy. Instead, you just try to take advantage of the board when it comes to your turn. So, though it might sound like an oxymoron – it’s a race, but in slow motion – and it’s as compelling as one at top speed. You just get the chance to watch everything develop; kinda like a baseball game, but with less adjusting of personal body parts and a lot less chewing tobacco. In my first two games, I felt that the game might have ended a little before I was ready to be done. Even in a 4p game, the entire board had not been opened up, and it felt like we were leaving some possible game behind. However, now with the wisdom of a few games – I can see that you need to have some of this cushion. There should not be the expectation that the entire board will be played. This forces you to choose carefully where you want to open exploitations and place your build sites. If you do not get others to join you in a far-flung corner of the board, you could end up stranded. Turns can go by pretty quick. As there are at most 6 actions between the end of your previous turn and the start of your next one, you can often be fully planned by the time your turn arrives. It is not uncommon for a lap around the table to take less than 20 seconds in particular places – as people drop down meadow tiles or move resources rapidly. When it gets closer to buying a card – or making sure that you can get to one before an opponent – you might have to step back and take a second to survey the board, but these are more the exception to Via Nebula. Thought I’ve just talked about the speed of turns, I’ve found the game to be compelling in its slowness. And by that, I don’t mean slowness on the clock. Heck, the game is pretty much complete in about 30 minutes. What I mean by slowness is how the action develops. With each player only getting two action points a turn, you can watch someone slowly build up towards a card purchase. You can try to race them to a particular card; hoping that you get the right resources available to you at the right time – or that someone makes a play that assists you along the way. The components are well done, especially the box insert. Space Cowboys has once again gone out of their way to make a custom vacuum tray that has slots that exactly the right size. Heck, even the wells for the resources are depressions in the shape of the goods that they will hold. To further impress me, the cutout for the board is so exact that you really have to force it into place when you put it away. This does have the awesome benefit of making sure that none of the component move out of their vac-tray areas – even if you store the game on its side! There are very few games that I own that get put away using only the given insert – but Asmodee seems to be cornering the market on this. Time Stories and Quadropolis are two other recent examples of such superior packaging. So far, this game has met every expectation I had of it, and makes me believe again in the genius of Martin Wallace’s mind. We’ve had no rules issues with the game at all, and it has been enjoyed by almost every gamer that I’ve played with thus far. It might just be that this is less complicated/complex that a “usual” Wallace game, and that now aligns more with my current gaming style (just as the super complex Age of Steam matched my love for chewy hard strategy games 15 years ago). This is not the sort of Wallace game that I’d recommend that you wait for the second edition so that you can get a playable version with all the wrinkles ironed out. This is one I’d recommend that you go get now before the first print run is sold out. Alan How: Early days as I have only played one game in two player mode. It was enjoyable if not enthralling and shows its designer’s lineage in track connecting games. I am looking forward to a game with more players as the degree of interaction is too light in a two player game. I’d agree with Dale’s comments about the insert and the tight fitting board. The length of the rules disguise an easier game- it is really straightforward. 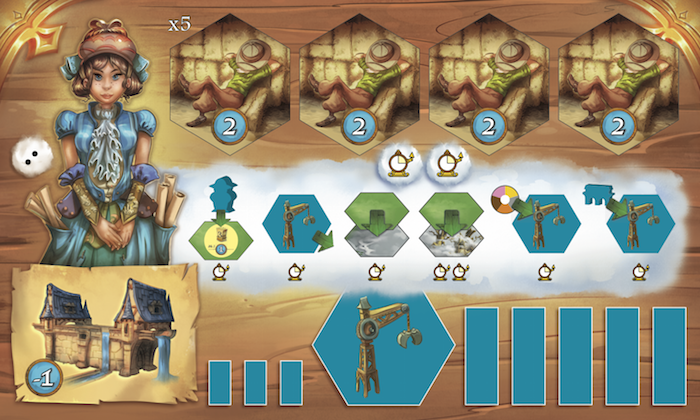 Chris Wray (2 Plays): Dale’s review is spot on: this game shows Wallace’s brilliant mind. I think this middle-weight pickup-and-deliver game is likely to be a hit this year. The fun comes from the fact that you’re exploring the valley and exploiting resources cooperatively, and you can take advantage of your opponent’s moves by anticipating what they’re going to do. While this isn’t a railroad game, it kind of feels like a lighter version of one. Toss in the beautiful artwork and the clever scoring, and I think this is one of Wallace’s better recent games. Oh, and if Box Insert of the Year was a thing, this would be a sure bet. 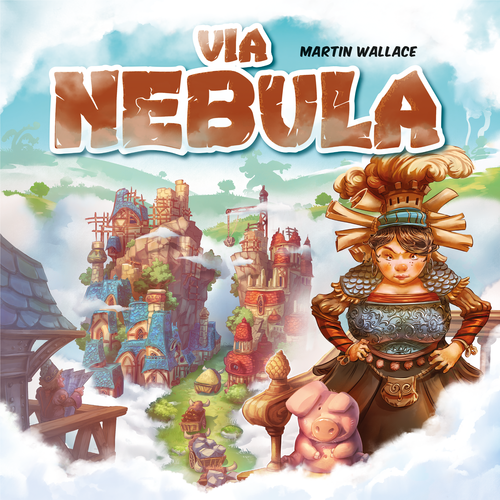 Jay Bloodworth: Via Nebula, like many Wallace games, has an interesting rhythm. You hear the rules and assume you know what the tempo and the major beats of the game are going to be, then start playing and find it’s not at all what you expected. In the case of Via Nebula, I went into the game assuming it was about planning and finding clever routes. Instead, it turns out to be much more about pushing your luck and making sure you can exploit your opponent’s hard work better than they can exploit yours. It’s not a purely tactical game, but it is a game that demands nimbleness. For me I think it will fit nicely in the “Filler Plus” category for when I only have 40 minutes but want to feel like I’ve played a real game.